Opening just over three months ago at the end of April, Eliot and Vine is a relatively new restaurant on the Halifax scene. As I first enter the building, I immediately notice the clean, Mediterranean aesthetic. Designed by local architecture and advertising agency Breakhouse Inc., the establishment has a wide-open and airy but elegant feel that is accented by smooth jazz playing in the background. 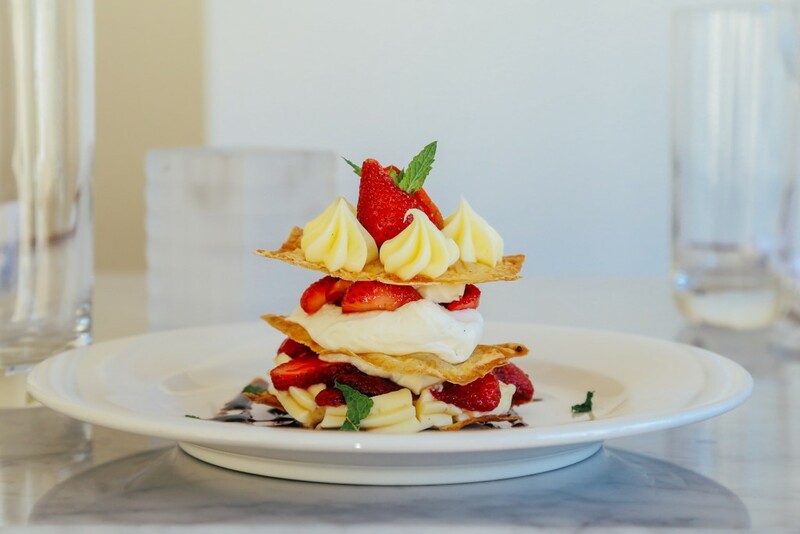 Self-described as a restaurant that specializes in European cuisine, Eliot & Vine is the perfect place to take a fancy first date, treat the family to dinner, or even grab a casual bite with friends. Speaking of food, let’s get down to business – I’m starving! First off, I have the pork belly with a glass of Nine Locks E.S.B. Extra Special Bitter to pair. The braised pork belly is soft, sweet, and melt in your mouth tender. The maple, ginger, and orange reduction creates a slight zest. The beer is hoppy, smooth, and allows me to fully savour the smoked cheddar polenta. This light dish is a fitting welcome to the evening. Next up are pan-seared Digby scallops paired with a 2014 Chardonnay (Wente Morning Fog, USA). With their inviting smell and artistic presentation, I feel like digging in is a sin, yet delaying another minute is just as much of an infraction. The first bite reveals a springy consistency in the scallops that is countered quite well with the texture of the crispy pancetta bits and bacon dust. The fried quail egg offers a nice visual touch while the butter-poached leeks really add another dimension of flavour. Overall the dish is crisp, smooth, and fresh. With a few dishes from the ‘first’ section under my belt, I move on to the main course – confit duck leg with fingerling potatoes and a glass of 2014 Pinot Noir (Ballard Road, USA). With a color scheme and aroma strangely similar to turkey and cranberry sauce, this dish is vaguely reminiscent of the best thanksgiving dinner you’ve ever had. My fork glides into the confit duck meat with ease and picks up a piece of lemon rosemary roasted fingerling potato. Raspberry gastrique smears the plate and your palate with a colorful and fruity taste. It’s also zingy and fresh thanks to the carrot and ginger puree, but don’t worry, the red wine is the perfect pairing to wash it down and prepare you for many more bites. Now I move on to the grilled pork tenderloin – a 24-hour-brined beauty topped with an egg and oil-based Frankfurt sauce consisting of seven herbs and duck fat double-smoked bacon sauerkraut served with a generous portion of pommes gaufrettes (or waffle chips in English). This dish is the nail in the coffin. As it arrives at the table, it reminds me almost of Mediterranean street food – smoky and spicy, until the sauerkraut kicks in with a hint of sour. I toss the potato gaufrettes into my mouth one at a time – they are salty and crunchy, the perfect compliment to the pork. This dish brings a smile to my face as I surrender to one of the best flavour combinations I have ever experienced. Before I throw in the towel, apparently there are two cocktails I simply must try. The first is called the Fig Heaven: Metaxa brandy, fig preserve, lime, and apple. You can barely taste the alcohol, but unlike those notoriously sugary bar drinks, it is not overpoweringly sweet. It’s mostly citrusy until the apple hits your tongue to leave you with a sweet aftertaste. This is an example of a perfectly balanced cocktail, with the brandy taking a backseat to the citrus and sweetness but still making its presence known. While I am not the biggest cocktail drinker, I know that any fan of lemonade would be into this. The next drink is the Elderflower G&T: gin, elderflower liqueur, lime, and grapefruit. The first thing I notice is the floral quality – it is light, clean, fruity, fresh and a damn fine thirst quencher for the hot summer day we’ve been blessed with. To conclude the evening, I am treated to a dessert dish called the napoléon: marinated strawberries, cracked pepper phyllo, vanilla custard, balsamic reduction, and mint on the plate for garnish. This is a layered dish that falls into chaos quickly, but it is to the benefit of the dining experience. Every bite is different as the flavours fight for your attention, and with all that chaos going on, the balsamic reduction at the bottom of the plate finds itself anchoring the taste with a kick of contrasting flavor. The mint garnish kicks in at the tail end to top everything off. After devouring all the dishes, I slump back into my seat, flabbergasted. I feel myself lost in bliss. For all I know, I am somewhere in Europe – maybe Santorini, Greece – feeling the breeze rolling in through the windows. It’s an odd feeling leaving a restaurant feeling enriched for simply spending an evening in it, but somehow I feel like a better person than when I arrived. All there’s left to do is come see for yourself. A taste of Europe off Cunard, indeed.